TP-Link Archer A9 is TP-Link latest mid range wireless router with updated hardware for better performance and coverage. At the price range of RM4xx++, it will be a good choice for an affordable upgrade to the router provided by your ISP. Despite looking very similar to the Archer A7, the A9 is a significantly improved wireless router with upgraded hardware and components. TP-Link Archer A9 now features beamforming and MU-MIMO both the Archer A7/C7 lacks. The WiFi ability has been updated to a slightly faster AC1900 as well. With that, the router will perform better in terms of WiFi coverage and performance with the upgraded hardware. Powering TP-Link Archer A9 is a Qualcomm quad-core processor with 128MB RAM. The router also features updated Qualcomm QCA9984 chipset on the 5Ghz band on 3×3 mode. The chipset is known for really good performance and commonly seen in high end Enterprise AP. This is a significant step up against the Archer A7 and also against Tenda AC18 as Tenda’s AC18 does not support MU-MIMO. TP-Link Archer A9 looks exactly the same as the Archer A7 apart from the AC1900. The design is still really practical with individual LAN port status indicator which many brands stopped doing to save cost. It has 3 non-removable external antennas and an additional 4th antennas inside for the 2.4Ghz band. On the back, we found 4 Gigabit Ethernet LAN ports and a single USB port for file sharing and printer sharing. Full specs here. 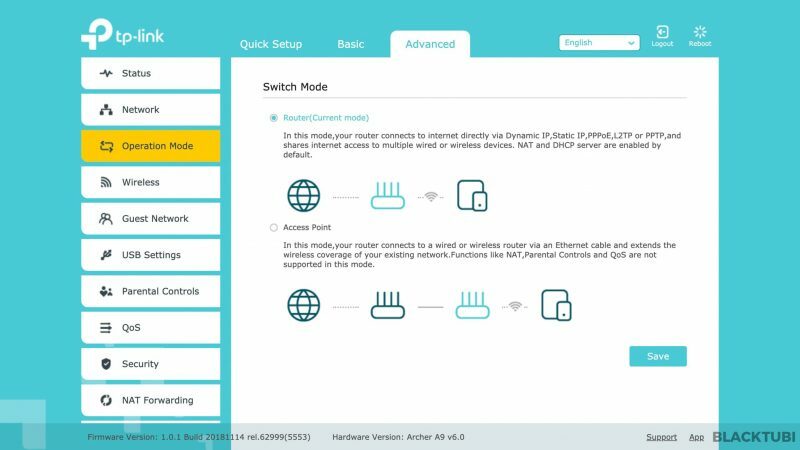 TP-Link Archer A9 is very easy to setup with the built-in setup wizard. We connected this router to the Unifi modem and insert the PPPoE username and password obtained from TM. Remember to select the Unifi profile if not your Internet will not work. 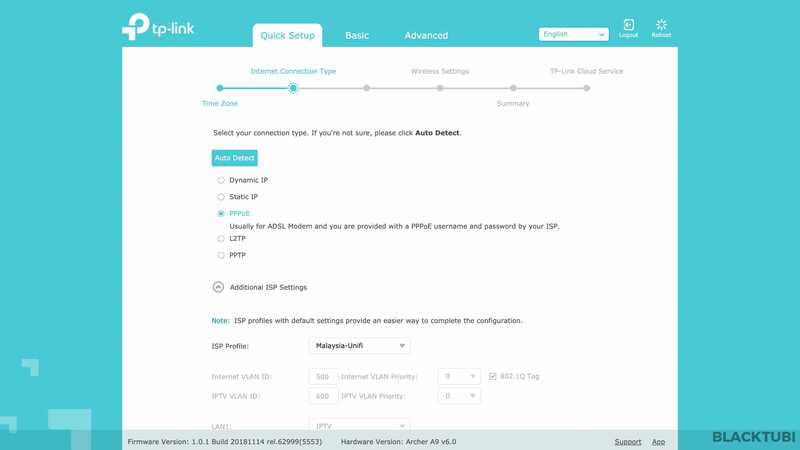 We written a handy guide for TP-Link Unifi setup guide here. TP-Link Archer A9 also features multiple improvements in the firmware. The interface is slightly updated with slight changes for usability and it loads slightly faster as well. TP-Link firmware is easy to setup and all information are clearly displayed these days. 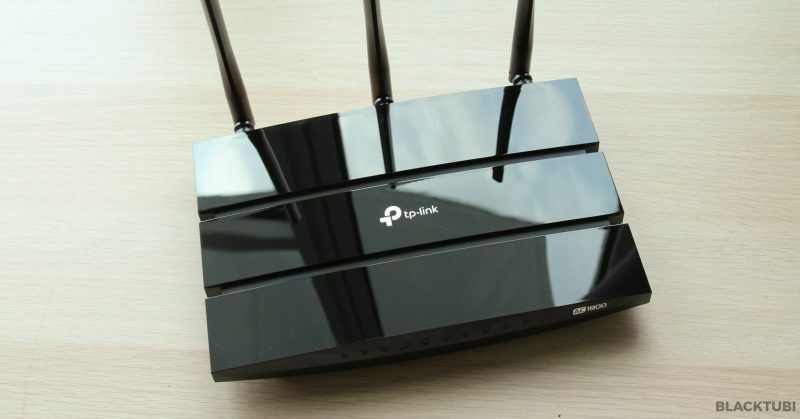 TP-Link has always been conservative in terms of features but all the basics are there with some valuable additions. 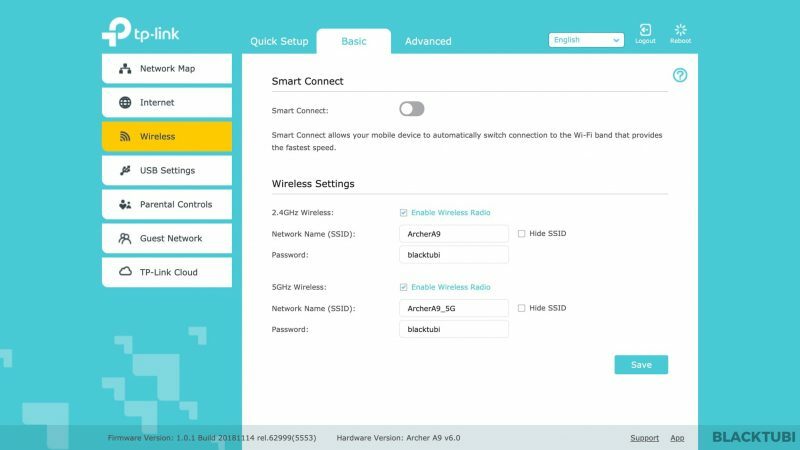 You can enable Smart Connect which will use the same name for the 2 bands. 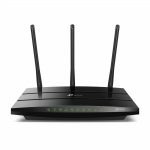 The router will automatically steer your devices to the 5Ghz and 2.4Ghz band depending on signal. TP-Link Archer A9 also comes with an access point mode if required. The router comes with a priority based QoS function. It will let you to set which device to have high priority. We do not recommend using QoS if your Internet is faster than 100Mbps as it does more harm than good. 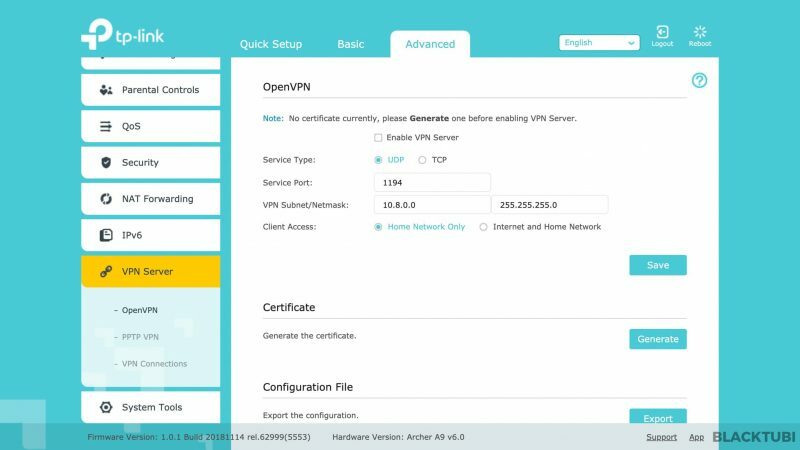 There is a built-in VPN server for remote connection to your home network. The USB port can support printer sharing as well as file sharing. TP-Link Archer A9 features the TP-Link Tether app for remote monitoring. 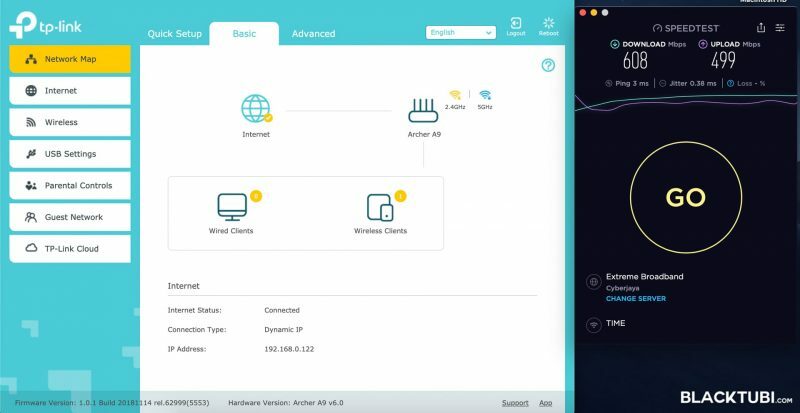 You can connect the Archer A9 to TP-Link cloud which allows you to manage your router remotely with a TP-Link ID. 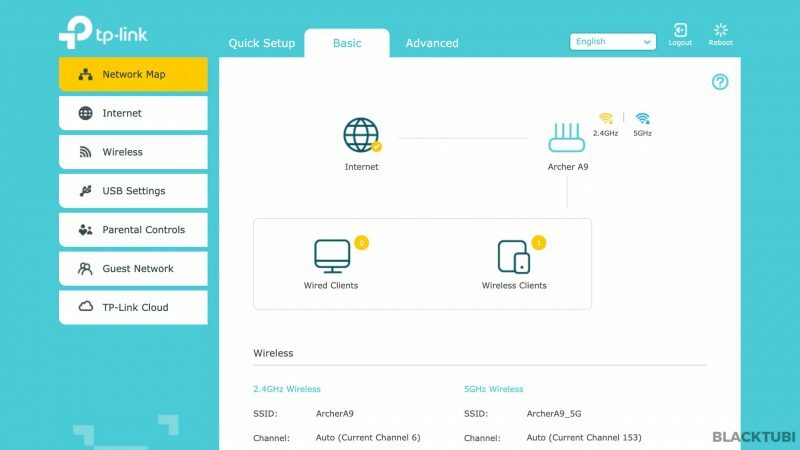 The app is handy in some circumstances where you want to have a quick glance on the status of the wireless router. It will let you to see which devices are connected and let you to change some settings quickly. We used Ookla’s Speedtest.net to test the maximum speed the router can handle on our 1 Gigabit Internet connection. This is tested via a wired Ethernet cable. 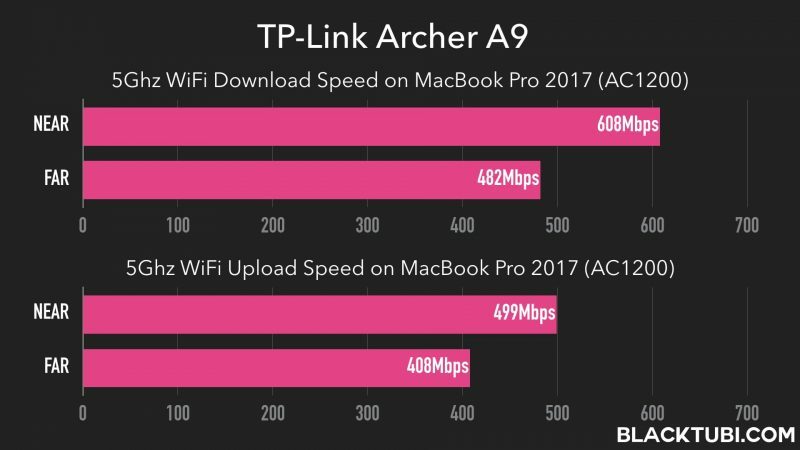 TP-Link Archer A9 can support up to 941Mbps which is the maximum speed possible on Gigabit Ethernet connection. We tested the WiFi speed of the Archer A9 by running speedtest with Ookla’s Speedtest.net on our Macbook Pro with an AC1200 wireless receiver. Most devices in the market only support up to AC1200 receiver and AC1200 receiverswill peak at around 600Mbps. We will be testing the speed at 2 distances from the wireless router. The far distance will be over 7 meters with a wall in between. TP-Link Archer A9 features really good WiFi speed on the 5Ghz band. We are getting way over 600Mbps on the close distance test. As for longer distance, it is still getting a really impressive 482Mbps. Do note that this is from a router less than RM500. We can see the combination of newer hardware and the inclusion of Beamforming actually make a difference in performance. The router is definitely an A+ for the 5Ghz performance in this range. The WiFi coverage is slightly stronger than the Archer A7 as well. TP-Link Archer A9 also performed much faster than the Tenda AC18 in our WiFi speed test. This is likely due to the much newer chipset being used on the Archer A9 compared to the older Broadcom BCM4360 on the Tenda AC18. 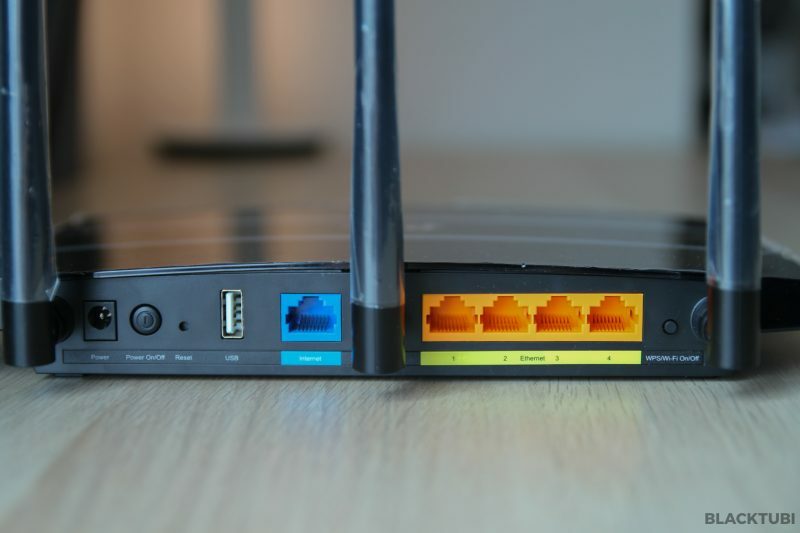 Wireless routers are not built equally despite having the same rating as the actual performance depends on the components used and circuitry design. Thus, we always resort to testing the routers manually to see their actual real life performance. 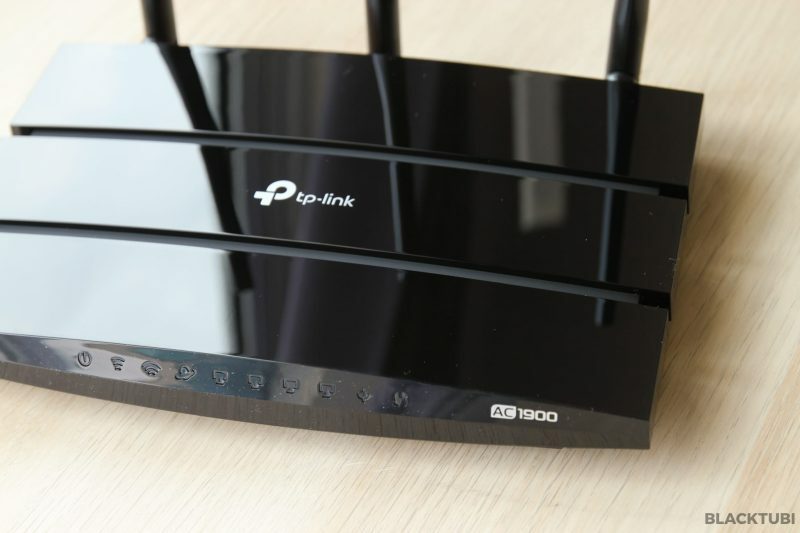 TP-Link Archer A9 is a great WiFi router with good performance and decent WiFi coverage. We highly recommend this router to those looking for an affordable WiFi router yet performs decently. This is our favorite mid range wireless router currently due to the affordable price point and good performance. Like all new TP-Link routers, it supports Unifi HyppTV and comes with 3 years warranty. It also supports Unifi, Maxis Fibre and TIME. If you are wondering which TP-Link routers to buy, we would suggest save up a bit more and get the Archer A9, it is a really good product. 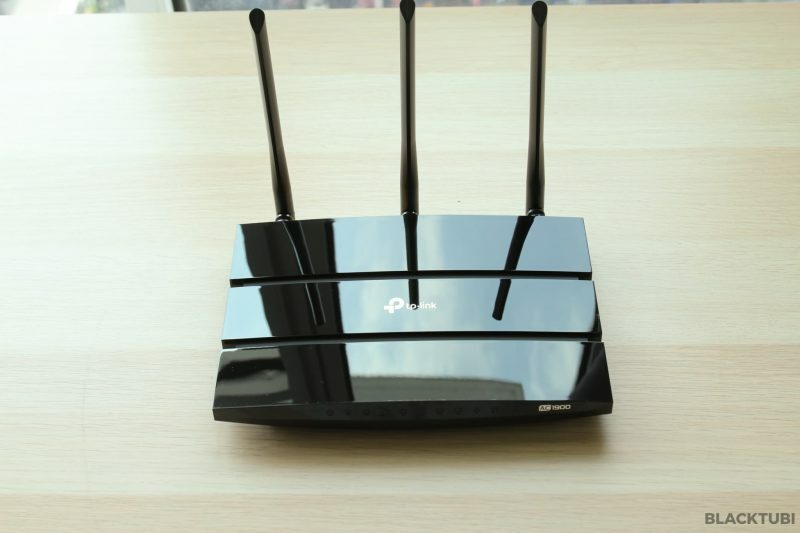 TP-Link Archer A9 is our favorite mid range router with fast WiFi speed and stable firmware.